Joachim (whose name means Yahweh prepares), was the father of the Blessed Virgin Mary. If we were to obey the warning of St. Peter Damian, we should consider it a blameable and needless curiosity to inquire about those things that the Evangelists did not deem it advisable to relate, and, in particular, about the parents of the Blessed Virgin (Serm. iii de Nativ. B.M.V.). 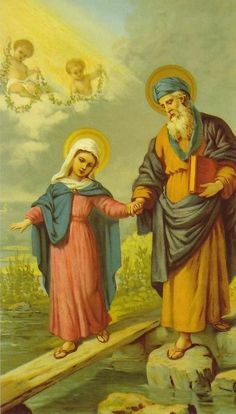 Tradition nevertheless, grounded on very old testimonies, very early hailed Saints Joachim and Anne as the father and mother of the Mother of God. True, this tradition seems to rest ultimately on the so-called "Gospel of James", the "Gospel of the Nativity of the Blessed Mary", and the Pseudo-Matthew, or "Book of the Nativity of the Blessed Virgin Mary and of the Childhood of the Saviour"; and this origin is likely to rouse well-founded suspicions. It should be borne in mind, however, that the apocryphal character of these writings, that is to say, their rejection from the canon, and their ungenuineness do not imply that no heed whatever should be taken of some of their assertions; side by side, indeed, with unwarranted and legendary facts, they contain some historical data borrowed from reliable traditions or documents; and difficult though it is to distinguish in them the wheat from the tares, it would be unwise and uncritical indiscriminately to reject the whole. Some commentators, who believe that the genealogy given by St. Luke is that of the Blessed Virgin, find the mention of Joachim in Heli (Luke, iii, 23; Eliachim, i.e. Jeho-achim), and explain that Joseph had, in the eyes of the law, become by his marriage the son of Joachim. That such is the purpose and the meaning of the Evangelist is very doubtful, and so is the identification proposed between the two names Heli and Joachim. Neither can it be asserted with certainty, in spite of the authority of the Bollandists, that Joachim was Heli's son and Joseph's brother; nor, as is sometimes affirmed, from sources of very doubtful value, that he had large possessions in herds and flocks. Much more interesting are the beautiful lines in which the "Gospel of James" describes how, in their old age, Joachim and Anne received the reward of their prayers to obtain issue. Tradition has it that the parents of the Blessed Virgin, who, apparently, first lived in Galilee, came later on to settle in Jerusalem; there the Blessed Virgin was born and reared; there also they died and were buried. A church, known at various epochs as St. Mary, St. Mary ubi nata est, St. Mary in Probatica, Holy Probatica, St. Anne, was built during the fourth century, possibly by St. Helena, on the site of the house of St. Joachim and St. Anne, and their tombs were there honoured until the close of the ninth century, when the church was converted into a Moslem school. The crypt which formerly contained the holy tombs was rediscovered on 18 March, 1889. St. Joachim was honoured very early by the Greeks, who celebrate his feast on the day following the Blessed Virgin's birthday; the Latins were slow to admit it to their calendar, where it found place sometimes on 16 Sept. and sometimes on 9 Dec. Assigned by Julius II to 20 March, the solemnity was suppressed some fifty years later, restored by Gregory XV (1622), fixed by Clement XII (1738) on the Sunday after the Assumption, and finally raised to the rank of double of the second class by Leo XIII (1 Aug., 1879).